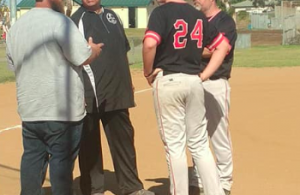 SANTEE (2-24-2019) – When West Hills High baseball coach Mickey Deutchman was asked to take over the Wolf Pack baseball program prior to the 2016 season, he told school officials it would take at least three years to correct many of the ballclub’s inadequacies. Following a series of showers delaying the season, the 2019 campaign debuted Saturday (Feb. 23) with results expected by Mickey D.
Senior Gavin Kondyra tossed five solid innings of relief and sophomore Kyle Dobyns retired six of the seven batters he faced as the starter, combining on a 2-hit shutout as West Hills swamped visiting San Diego High, 14-0. 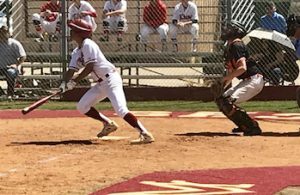 Both Kondyra and Dobyns struck out 3 batters, while junior Andrew Ritayik belted a double and drove in 4 runs in the rout. Dobyns and junior Joe Kyle Dobyns also added 2 RBI each in the first inning, hitting the scoreboard in five of the team’s six trips to the plate. West Hills would eventually tally 21 consecutive runs on the day, mounting a 7-0 lead after one inning against powerful Mater Dei Catholic. However, the Crusaders rallied for an 11-8 win. Mater Dei twice rallied to knot the contest at 7-7 and 8-8 before scoring three times in the 6th to secure the lead for the first time. A 6-run rally in the fourth would tie it, but the Pack reclaimed the lead on a double by Ritayik, the catcher. However, the bullpen couldn’t hold either lead, as MDC’s Sabino Muro knocked in three runs. Deutchman is the first WHHS baseball coach this century to last more than three seasons, helping stabilize the program. 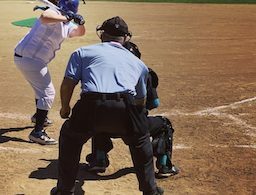 He is better known as the long-time owner/manager of the San Diego Stars semipro/summer collegiate baseball team, which reached the national quarterfinals of the National Baseball Congress World Series after starting last summer with an 18-game winning streak. The rain-delayed Aztec-Foothiller Tournament continues next week, Mater Dei (1-0) next plays at Helix on Monday (Feb. 25) in a rain make-up contest; West Hills returns to action Wednesday on the road against Coronado at picturesque Silver Strand School.